This royal-inspired line pulls out all stops to treat kids like kings (and queens): note the DJ workshops and hip-hop classes in the teen lounges and pizza parties for tots 3 and up. But this particular tour is amazing for showing kids some of the best of the West in one swoop, including Sonoma, Muir Woods, the San Diego Zoo, and Ensenada, Mexico’s folklore fiesta. 7-days from $549 per person, roundtrip from L.A.
It’s always a magical day aboard the Disney Wonder, thanks to live shows of Toy Story—The Musical, pirate-themed parties on deck, and first-run 3D movies in the Deco-inspired movie palace. You’ll have a tough time getting them off the boat in Ensenada, but do: it’s the ‘Cinderella of the Pacific,” after all. 3-night cruise from $1,686 per person, roundtrip from San Diego. Some kids simply won’t tolerate a long cruise. For them, we present one of the all-time quickest, complete with occasional orca sightings and a dock in Port Townsend near Elevated Ice Cream, the place for locally made flavors like Swiss Orange Chocolate Chip since 1977. 35 minutes from $3.30 per person, from Port Townsend to Keystone. 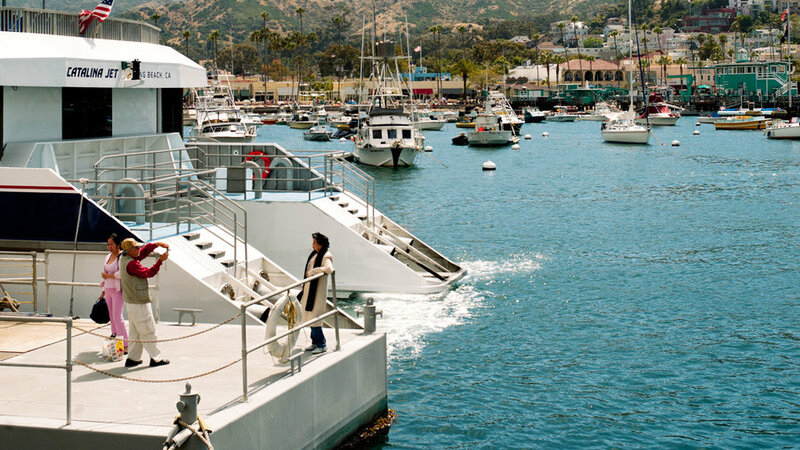 The best part of this hour-long ride to Catalina for adults? For $15, you can upgrade to a lounge with leather seats and complimentary snack and beverage-proffering attendants. But kiddos will love the 35-knot, high-speed clip—and the fact that a world of adventures awaits on Catalina, including 18 holes of mini golf. 60 minutes, from $36 each way. Thought Bora Bora was off-limits to kids? Paul Gauguin cruises will have you think again, with their Ambassadors of the Environment program curated by none other than Jean-Michel Cousteau. Here, they’ll be racing hermit crabs, snorkeling off private beaches, and hiking Moorea’s tropical rainforest with an archeologist. They won’t even miss their phones. 7-night cruise from $5,545, including round-trip airfare from Los Angeles. The grande dame of cruise lines is among the world’s best for kids, thanks to a group of modern Mary Poppins-esque British nannies who’ll look after them in clubs for three age groups, from toddler to teen. That’s if you can get them back on board, with excursions like cycling past windmills and ducking into Roose’s Chocolate World for a cavity-worthy taste of the local sweet life. 4 nights from $669 per person, round trip from Southampton, England. This trip is best for teens who roll their eyes at the words “kids’ club,” because it focuses on activities off-site: they may spot turtles nesting on Santiago Island, swim with sea lions on Gardner Bay, and document every minute for their Instagram. 7 days from $8,450, from Baltra to Baltra.